The Los Angeles Region MS4 Permit is very specific regarding post-construction storm water management options. The current L.A. County MS4 permit (Order R4-2012-0175) requires that biofiltration systems on land development projects either be designed and sized according to “Attachment H – Bioretention/Biofiltration Design Criteria” or be approved by the executive officer of the Regional Board as providing equivalent performance. With the cost of land in Southern California ever increasing, the challenge of designing and implementing cost-effective and regulatory compliant projects also increases. In an effort to reduce the BMP footprint, decrease construction costs and reduce long-term costs on future projects, Contech Engineered Solutions pursued an alternative approval to Attachment H with the Filterra bioretention system, which is similar to bioretention in its function and application, but has been optimized for high volume and flow treatment, as well as high pollutant removal. A study by Geosyntec evaluated equivalent performance between conventional biofiltration BMPs meeting the criteria of the MS4 permit and Filterra systems as an alternate biofiltration BMP. Equivalency was determined based on the factors that influence the performance of storm water BMPs, including capture efficiency, volume reduction and concentration reduction. The Crossroads Parkway Campus Building is one of the first projects to propose and gain approval from the executive officer of the Regional Board for an alternative approval to Attachment H.
City of Industry is an almost entirely industrialized suburb of Los Angeles County. Storm water runoff from the neighborhood and commercial areas convey a variety of pollutant discharges into the local storm drain systems. These systems feed into the San Gabriel River Watershed, which connects the city to the Pacific Ocean via the Los Angeles River. As a contributing source of storm water discharge to Southern California’s tourism-heavy beaches, achieving compliance under the Los Angeles Regional MS4 permit was a high priority. With an accelerated deadline and a relatively small amount of footprint available, City of Industry and PBLA Eng. Inc. selected the Filterra biofiltration system to capture and treat the site’s trash, debris, sediments and metals. These fit within a footprint far more compact than traditional biofiltration sized per Attachment H. Contech provided support to both the city and the engineering team in navigating the approval process required by the Regional Water Quality Control Board. Seven Filterra offline systems of various sizes were installed. The Filterra offline configuration is economical and simple. It utilizes a downstream catch basin or curb inlet for bypass flows, allowing for the shallowest profile and most flexible design of any of the Filterra configurations. 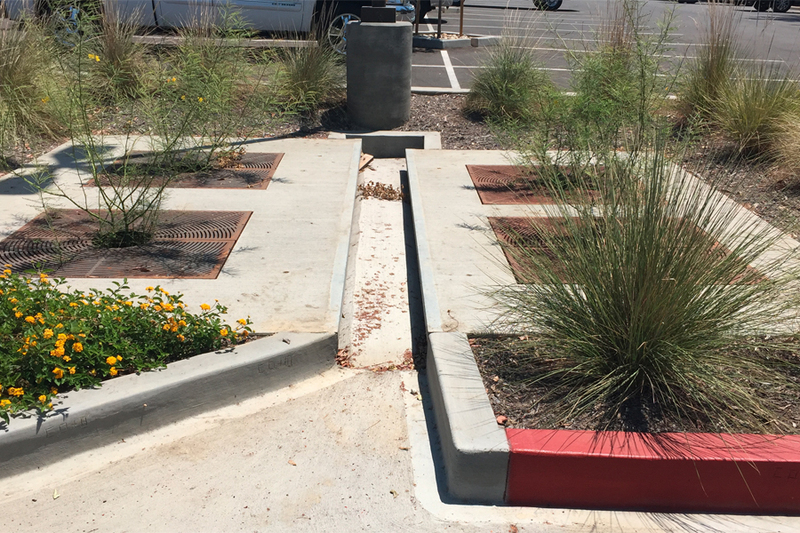 Contech storm water design engineers assisted PBLA by providing product-specific engineering calculations to properly size the units and meet the strict regulatory requirements. Contech supported the contractor through a tight installation schedule to ensure a timely and proper installation. A Contech certified maintenance provider was on site to perform the planting of the vegetation and activation of the system. Since installation, the plants in the Filterra units are thriving, enhancing the appearance of the largely industrial site while removing pollutants.